When installing anti-malware tools on your machine makes things worse, it's one hint that there may already be a deeper problem. I followed your recommendation and installed Microsoft Security Essentials. It's been a nightmare ever since. Things are worse than before. I don't know how you can recommend something like that. What do I do to get this mess cleaned up? I stand by my recommendation. Microsoft Security Essentials is a solid anti-malware tool that works and works well in the vast majority of cases. I like it because it's a one-stop solution for a fairly broad base of protection and it's kept up to date by Windows Update. So why'd it mess up your machine so badly? And I have some steps for you to try and dig out of this mess. My theory is simply this: your machine was already infected with malware. Malware these days is pretty sophisticated and part of that sophistication is that viruses and spyware will take steps to protect themselves. Most often, this is in the form of preventing anti-malware tools from running or updating, and perhaps even preventing you from accessing download sites where you might get anti-malware tools. What I believe has happened is that the malware already on your machine seriously interfered with your installation of Microsoft Security Essentials. Either the installation was prevented or corrupted or the program's ability to run was somehow disabled. In other words, the malware made a further mess of things. That makes things kinda tough, because if you have an infected machine, one of the first things that you want to do is to update or install anti-malware tools to eradicate the infection. But you can't clean the infection ... because the machine is infected. Using a different machine, download the Microsoft Standalone System Sweeper and burn that to a CD. Now, reboot your infected computer from that CD and run the tool to scan your machine's hard drive for malware. Booting from that CD prevents the malware on your machine from ever gaining control and thereby stopping that malware from interfering with the anti-malware tool. Which, by the way, is really just a version of Microsoft Security Essentials, in a stand-alone, boot-from-cd form. My guess is that there's a good chance that the sweeper will detect and remove the malware that started all of this. If not, I'd point you at How do I recover from a bad virus infection? for further, more aggressive steps to take to rid yourself of the problem. If there's malware on your machine, then all bets are off; it's not really your machine any more. As such, that means that the malware could be responsible for all sorts of mischief, particularly making anti-malware tools fail or otherwise misbehave. Microsoft Security Essentials is a good anti-malware tool. Because of that, it's very likely that malware would target it, not just to prevent it from working, but perhaps even to make it look bad. Microsoft Standalone System Sweeper - Clean malware from your machine The Microsoft Standalone System Sweeper is a standalone, bootable tool from Microsoft that allows you to scan for and remove malware in difficult situations. How do I recover from a bad virus infection? Recovering from a bad virus infection isn't always easy, but there are some things to try before drastic measures need to be taken. I stand by your recommendation of MSE but after installing MSE there is a process which slows down the pc and it is MsMpEng.exe (uses up to 90,000 of resources) this process is a nightmare and I have contacted Microsoft customer support and they weren't able to help me, although my problem still exists, I still use MSE. Not sure what you mean by "90,000 of resources". There is an option in MSE to limit the amount of CPU usage. In my experience I see MSE hit most heavily only while it's performing a scan, and even then not on most machines.I'd look at configuring the options controlling when to scan, and the aforementioned CPU usage. I use Microsoft Security Essentials and have found it to be very good, no problems at all. I installed MSE on my lap top and had all sorts of problems, OS is Vista and after hours searching removed windows defender in add/and remove and this solved all the problems that I had experienced, defender should automatically shut down when you insatll MSE but in my case it failed, its worth checking this out if you are still having problems. I agree with Leo. And if 90,000 is slowing your computer down, you have a much bigger problem somewhere else....or your machine is in serious need of an upgrade. Some programs (streaming video, for instance) pile up 600,000 before it's time to reboot, and I'm sure other, better machines, go longer. I've read that MSE may be slowed if it's allowed to scan its own folders. The recommendation is to go to MSE's Settings | Excluded Files and Locations and exclude the following folders: Program Files\Microsoft Security Essentials, Program Data\Microsoft\Microsoft Antimalware, Program Data\Microsoft\Microsoft Security Client, and Program Data\Microsoft\Microsoft Security Essentials. The folder names may vary somewhat depending on whether you're using XP, Vista or Windows 7, but the principle is the same. I remember someone who already had an antivirus program installed on their computer and then installed another one. His computer was almost unusable until we finally uninstalled one of them. My guess is that they each thought the other was a virus 'cause of the virus signatures each used. I used Norton, McAfee, AVG, Avast, etc, and eventually settled on MSE for all our PCs at home. It is slim, low demand on processor capacity, and has also protected us from all types of "crap". How do I know? I sometimes run a web based scanners (TrendMicro, Norton, etc) just to verify, but nothing has been triggered at all since MSE was installed. Another great article and suggestion from the Leo Meister I recently put MSE on both my machines (Desktop XP and Laptop Vista). I had three scanners/virus protectors on Vista (2 turned off) but even off they messed up MSE! The key is to definitely remove everything before installing MSE! Finally fixed that self-made fiasco and both machines run fine. Thanks nytibcp for your tip! - does not require one to be very technical in order to understand and change the settings, and in case - should it find a malware on your PC or external hard/thumb drive - it offers a straight forward solution and suggests which actions to take therefore not confusing an average user with the choice to make in order to clean up PC. Please do not make any rushed conclusions until you carefully investigate and find out what exactly the cause of the problem is in your particular case (like Leo described in the article). If for any reason you’re not able to do it by yourself then address the issue to a tech guy like Leo or elsewhere, but please do not make a statement until you’re absolutely certain about the issue, product or service that the website’s author recommends/offers. 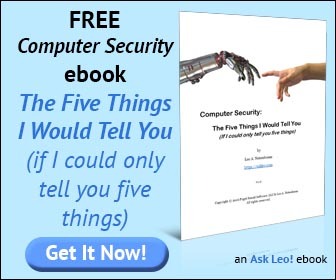 At the end of the day, I think, we should be very grateful for the service like Leo provides – highly technical and professional, yet very clear and relatively easy to understand for an average user. And it’s free. Also, have you uninstalled your previous antivirus software as you must not run more than one on the same PC at the same time (I hope you’re aware of that). Your description suggests that your system is ‘messy’, - is it also unstable (you, unfortunately, did not describe what exactly you mean by ‘messy’)? That could help Leo to help yourself. Unstable system could be also caused by running more than one antivirus software on the same PC at the same time in addition to all the points that Leo has covered in his article. Please read some other articles on "Ask Leo!" in order to educate yourself and understand more on a specific subject - there's really so much covered on this website. I have used M.S.E now since I discovered it from a Leo article , I installed the prog and also have A.V.G free adition M.S.E runs perfectly , I have had no problems to Date . I read every word that Leo writes and find the articles to be excellent and very well presented . I do so agree with all of the foregoing comments about Leo - he is invaluable to us all. This, however, does not make MSE infallible!!! I tried to install MSE on my (XP Home) having removed all previous security except WinFirewall of course. The Stand Alone had found nothing I should add. I experienced so many problems that I cannot remember them all but my desktop became a tortoise in the extreme. I and your contributor are not alone - I am an avid reader of all such sites as this and would say that MSE's popularity is not as 100% as comments here would seem to indicate. previous protection which is magnificent!! Nobody is mentioning if anyone is running TWO real time virus protection programs at the same time. If you do, and yes any antivirus program will crash or slow down, a lot. Pick one and get rid of any other real time scanners. This does not apply to on demand scanners, such as Malwarebytes FREE! edition(without the protection module). Of course, the Free edition does not come with the protection module. Potential users of Microsoft Standalone System Sweeper should know that it will only download to an SP3 version of Windows XP. Hi Leo, I downloaded the Microsoft Standalone System Sweeper (32-Bit version) on CD. After booting the CD and selecting drive C: (I have 2 systems on my pc [Win7 -32bit on drive C: (disk 1)] and [Win7 -64bit on drive D: (disk 0)]) the "Sweeper" discontinues with error message that I am using the 32-bit version on a 64-bit operating system. Disableing disk 0 (with the 64-bit OS) reveals the same error. Do I have to disconnect disk 0 before I can continue with the test? Remark: the 64-bit system was installed before I installed the 32-bit version and switched afterwards the drive letters. I'm wondering if C: and D: are reversed when booting in the sweeper. Try scanning the other drive. My guess is you'll need the 32 bit scanner to scan the drive with 32 bit Windows, and the 64 bit scanner to scan the drive with 64 bit Windows. I am doing just fine with Malwarebytes and Spysweeper thank you. If it ain't broke, don't fix it! I agree with Steven, definitely make sure that you are using ONLY ONE anti-virus. This applies to Firewalls as well. As far as 'anti-spyware' and 'anti-malware', you can usually run two or three without a problem. MSE has worked fine for me and other computers. I would make sure Windows Defender is disabled. Use Malwarebytes to scan and clean anything MSE doesn't detect. I agree with using Microsoft Standalone System Sweeper. But I would install it on a empty USB pen drive (Microsoft Standalone System Sweeper formats the USB drive so use an empty one). Then you can update it before you run it to get the latest data set. I do this weekly, so far it has found nothing. But it's free and runs off the USB drive so nothing is in use and it can check everything. To thank Soloman - 32-bit and, yes, all updates (service packs) installed as I have a licensed version of XP. Maybe this is a nefarious MS method to get me to update to Win 7? "I've read that MSE may be slowed if it's allowed to scan its own folders. The recommendation is to go to MSE's Settings | Excluded Files and Locations and exclude the following folders: Program Files\Microsoft Security Essentials, Program Data\Microsoft\Microsoft Antimalware, Program Data\Microsoft\Microsoft Security Client, and Program Data\Microsoft\Microsoft Security Essentials. The folder names may vary somewhat depending on whether you're using XP, Vista or Windows 7, but the principle is the same. I installed MSE program today after completely removing Avast Antivirus using it's own removal tool. With MSE running everything started taking forever to open and opening a file folder required a wait for files to appear. Definitely not good performance. Tried the above tip and now everything is fine. Thanks to nytibcp who suggested it.